GaryN wrote: I'm mildly surprised that even EU proponents can not seem to accept the possible magnitude of t the forces impinging Earth, not just the surface, but to many miles deep most likely. Second time today I've heard that. The other person was predicting a major earthquake in mid July for the western coast of South America. The only reason I'm passing it on here, is this person did tell me in spring 2004, that there would be a big earthquake in Indonesia in December of 2004. They did tell me the supposed mechanism (also involving outside forces impinging on the Earth,and taking 1-2 weeks to reach the surface). Hopefully that was a lucky guess on their part. I'm seriously hoping that this post is not one we will be talking about again. GaryN wrote:I think your idea really does belong in the Mad ideas section. You put the smiley right where I had intended to put one, but omitted to do so. Glad you interpreted it the way I meant it! Well, that all depends on the form of energy in that hairy fit. Yes, and I don't think we are playing with a full deck there, as the inductive properties of a large scale CME are not considered. 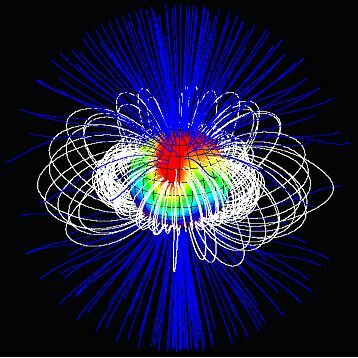 The pulsed (bursts as they are referred to in the literature) microwave frequency ion acoustic waves from a garden variety CME are recognized, but what about a mega scale CME where our protective shield may be shredded, or maybe occurring at the time of a very weak or even absent magnetosphere? It could be a very rapid process that sets off events like Yellowstone, who's activity may rise and fall over time as those little understood solar energies wax and wane. Will Yellowstone just keep getting more and more active, or will it quieten off again? Either way, I don't think any of our puny efforts could have much effect on the outcome. Ohmic heating for sure is involved, but I also think inductive too, in the larger events anyway. I was just scanning some of Capt.Staples book, "Cosmic Machinery in an Electro-Magnetic Universe", and I though of you Charles, that you might be interested in reading the book, he has some interesting ideas, and even if science has left him in the past, it's still an interesting read. It would take me for ever to scan the whole thing, the OCR stuff works pretty good, but mixed text and images really messes it up, and I have cleaned up what I have scanned so far, and put the rtf file up on my site. If there is anything in the index that interests you Charles, I could mail you the book, so long as you promise to send it back, if you like. He identified some magnetic flows without the use of modern technology and computers. Didn't get to fixing the index formatting, but it's understandable I think. Not long to wait then. I'd be interested in more detail of his prediction method though. I'm seriously hoping that this post is not one we will be talking about again. GaryN wrote: I was just scanning some of Capt.Staples book, "Cosmic Machinery in an Electro-Magnetic Universe"
I converted your RTF to HTML, and cleaned it up the rest of the way. The Renaissance tone is absolutely delightful. There might be useful insights in it, though extracting the value would be tedious. I'm really bad at returning books, so you'll have to hold onto it, but if you want to scan a section at a time and OCR it, I'll clean it up the rest of the way, for anybody else who finds it interesting. The introductory sections might provide a valuable overview of his approach. As concerns what effects our puny efforts might have in redirecting the telluric currents at Yellowstone, remember that everybody laughed when Franklin suggested that the current in a lightning strike could be redirected with a small copper wire. Sure, the wire gets vaporized, but by then, the discharge channel has been defined. Anyway, solid rock is a poor conductor, while a borehole that fills up with ground water would be an excellent conductor. I think that it would work. No shortage of ideas, and I haven't read all the document, but if I'm going to hang myself, it may as well be from a very different type of tree, so I am going to stay with the pinch initiated phenomena for all the energetic outpourings, and the structures associated with them. My model begins with what I don't think anyone else considers, and that is the vacuum, or the aether, as a non-linear optical medium. At lower energies, then x-rays can produce the gamma energies with the inverse Compton scattering, though pinches, as in lightning, can produce gamma rays by themselves, so I'd think the larger pinches could too. The non-linear medium allows for the optical rectification for the strong electric fields and thus the strong magnetic fields. One proposal for the pulsar emissions is the inner gap sparking, though there are different versions of that too. So they are looking to the vacuum spark, but I'd have the pinch, which would itself have a vacuum spark gap within magnetic filament, at the centre of these larger editions. The tokomak has not been very successful as of yet due to the plasma instabilities that can defeat the whole process, so I don't know why the instabilities would not occur at far higher energies. The torus to me is one of the structures that the dipole antenna (the pinch is the centre of the antenna) naturally creates, and the particle acceleration methods are fairly well studied, including the limitations due to there having to be two directions of acceleration, whereas the linear accelerator on has one. The wakefield accelerator, especially the magneto-pulsed version is the big kid on the block as far as that goes. Also, the non-linear optical medium may account for, and even greatly diminsh the actual energy output of what they are seeing, as they (I think) base the output on the supposed distance to these objects, and on the strength of the emissions needed for the 'light' to be able to reach us at the energies detected, while a non-linear medium allows for almost infinite travel of the energy by way of processes that only occur in that non-linear optical medium. Ballokes. Must have come from a supernova? We are seeing matter formed here by way of EM forces, or rather from opto-electrical processes if the vacuum is indeed a nonlinear medium, as the pinch is probably experiencing a little hicup in its supply line. Surprisingly, instead of the complex structure the researchers were expecting to find, they discovered a magnetic system as straightforward as that of the Earth or of a bar magnet. This discovery challenges our understanding of how the magnetic fields of the Sun and other stars are formed. Gee, ever consider the red dwarf may just be a planet,and that all the other Suns they think they see may just be planets too? Yes, a good job there is a Mad Ideas section on TB. Interesting: The red dwarf has a magnetic structure we would expect from a COLLAPSED object with gravitational segregation of charge (and differential rotation by depth), but the supernova has behavior we would expect from a COLLAPSING object with gravitational segregation of charge. Start simply. Pick three elements of your choice (A,B,and C), and only allow for stripping off one electron from each element. Say it is easiest for gravitational forces to pull apart element A into ion A and its electron. Do you see that if we have a gravitationally collapsing "cloud" of A,B, and C, we reach a point where A is "pulled apart" into its charged components,the B and C elements still gravitationally collapse (with less force), but the A ions are thrown off? We all agree that the neutral mass of B and C elements will continue to collapse, but the important point is that those A ions repel each other electrically with more force than they are attracted to each other and B and C gravitationally. So we end up with an expanding shell of A, around a collapsing core of B and C. That is until we get gravitational segregation of charge in element B, and the wave off B ions throw off from the collapsing core of neutral C.
Do you see where I'm going? The idea that we can't get collapse of matter into a "ball" of neutrons was important. I think that it is far more interesting, however, to consider what would have happened along the way. Even if you're not talking about atomic collapse under the force of gravity (which is ridiculous), but just talking about compressing gases into liquids, it's still a flawed concept. In Newtonian mechanics, there IS NO gravitational collapse!!! As matter gets compressed, the gravity field gets more dense. But the hydrostatic pressure increases also, which opposes further compression. Gravity obeys the inverse square law, but pressure increases by a cubic function, being directly proportional to the volume, which is in 3 dimensions. So the pressure increases faster than the gravity. This doesn't create an instability, capable of collapse if the threshold is exceeded. Rather, it creates the opposite interaction of forces -- it defines an equilibrium point, at which both forces will offset each other. If a gas is compressed beyond the hydrostatic/gravitational equilibrium, it will rebound back out, to a point as far above the equilibrium as it went below, and all other factors being the same, it will oscillate. There's no way around this in classical mechanics. This is why the gas inside a pneumatic shock absorber doesn't undergo gravitational collapse when hitting a big bump in the road -- the hydrostatic pressure forces the gas to expand back to its original volume. So thinking of a star as something that has collapsed, or is in the process of collapsing, under its own weight, introduces a misconception that could lead to errors later. IMO, gravity doesn't hold stars together (nor planets). The matter had to be rammed together with such momentum that another set of factors kicked in, namely charge separation due to electron degeneracy pressure, which sets up charged double-layers, which cling together due to their electrostatic attraction to each other. The only sense in which gravity is even a factor is that it is purely attractive, which means that the core will be under more pressure than the outsides, which means that the core gets ionized first. Then, alternating layers of charges organize themselves around that. But gravity doesn't hold the star together -- it merely organizes the electrostatic forces that do the job. And in this context, anything that gets ionized by pressure doesn't get blown out by electrostatic repulsion. The structure of the charged double-layers has to be taken into account. The Renaissance tone is absolutely delightful. Isn't it though. Even if it is fantasy, it's an enjoyable read. Sure, and I think I have figured a way to speed things up a bit here, but there are also a lot of ruled tables, and the OCR doesn't like them at all. Maybe I should request Gutenberg to look at doing it, I see they have done the George Warder "The Universe a Vast Electric Organism", which I mentioned on the other thread. Perhaps this does go into the spirituality and metaphysics dept. but seems to be equally interestingly written. Yes, but I also think it is complicating what should be a much simpler picture. The red dwarves can not be shown to be stars, and neither can any of the nearest stars to us, so any more distant objects can not be proven to be stars either. These are assumptions, and that is not a good basis to build any model on. That all those supposed stars are rather charged spheres, each with their own particular exospheres, and it is the elements in the exospheres undergoing energy level transitions that creates what the instruments see. This I believe is why Mars is so clearly naked eye visible, when it should not be. Its hydrogen and oxygen exosphere reaches out about 30,000 km from the centre of Mars, and Solar UV or x-ray emissions will make that exosphere glow, also in UV or x-rays, and it is that glow which is converted to visible light in our atmosphere. Yes, we can see a 60,000 km diameter glowing Mars by eye, with the aid of our atmosphere, no problem. I'm only accepting the objects that show they exist at a pinch in a flux tube as being real stars, or their bigger brothers which are thought to be from those collapsed matter objects, but which are rather creating matter and not sucking it in. They are still foot-dragging with the Solar probes, which have been a tremendously expensive, long term money spinner, and have nothing yet to show for it. Much simpler and far cheaper probes could have been launched towards Sol, just to see if the basic premises are correct, and then use the data from that probe to design the next one to withstand whatever conditions caused the first one to fail. How would communications be affected? Well, we don't know unless we try, so get on with it. I'm really wondering by now if the foot-dragging is more an effort to repress the true nature of the Sun, as that could bring down a lot of institutions that have built their castles on some very assumptive real estate. Following up on the earlier posts concerning volcanoes (starting here), I did a bunch more work on my volcano paper, so that's ready for review. but since the sun appears to be on the surface of the local cloud, and specifically, on the side closest to the G-cloud, doesn't that leave us with three choices? 1. Accept that your tidal model works for the Earth and moon, but doesn't apply to neighboring clouds. We both know that we don't get star formation inside a filament at z-pinch. That's O.K.,we don't see the sun at the center of a filament anyhow,but at the surface. Notice,however, if we have two filaments crossing each other at an angle (as in a pinch between two different filaments?) then your tidal model gives us a mechanism for charged material piling up at a point on the SURFACE of each filament (right where the two filaments come closest). Can we rule this out as a mechanism of star formation? @celeste: you're good at asking interesting questions! If I don't give an answer right away, it's because I don't have one. But here are some thoughts. Intersecting filaments were among the reasons why I stopped thinking in terms of electrodynamics, and started studying electrostatics, as the causal factor in star formation. To get electric currents moving through space at right angles to each other, there would have to be electric fields at right angles. But that isn't possible, since electric fields from multiple sources merge together, yielding a net field that splits the difference between them. Furthermore, if two currents came from two different sources, and merged at the intersection, how could the currents get split back apart again? Once merged, the electric field at any one point in space only points in one direction, and the z-pinch will help keep the current organized. So those "X" intersections cannot possibly be electric currents. But they very definitely can be electrostatic threads, similar to intersecting polymer chains built by polarized molecules. The graphene molecule is nothing but intersecting electrostatic bonds. And yes, there can be concentrations of matter at the intersections of filaments if they are electrostatic. The body force is entirely within the filament itself, like the tensile force in a rubber band. If two rubber bands are tied together, then yes, all forces lead to the intersection point, and when the filament starts breaking up into beads, an X connection would be a likely place for a star to form -- especially where the surfaces of the hollow filaments intersect. Furthermore, as the electric force stretches a filament tight, if the filament rotates, matter will get centrifuged to the edge of the filament, leaving a hollow tube (as we discussed elsewhere). I'm thinking that the rotation could come easily if the filament runs parallel to an external magnetic field. Then, as the diameter of the filament collapses, because the filament is being stretched lengthwise, matter moving toward the axis will get offset into a spiral by the Lorentz force. So hollow filament are expected, with stars forming at the edges, and with motion relative to the interstellar medium. In the "beads on a string" configuration, the filament breaks into pieces that collapse into stars distributed along the axis. This axial motion will constitute a current of sorts, and will show the telltale Amperian B-field wrapping around the filament, as is sometimes observed. But I don't think that the current runs through the whole filament -- I think that it's charged particles moving toward the bead, due to the electrostatic body force. It would be interesting to see if there was ever an example of the magnetic polarity of a filament changing, indicating that the "current" was traveling in the opposite direction. EVERYONE at Thunderbolts should see that one. Thank you Gary. Figure 4a, and its blow up beneath, alone will keep me up tonight. Such a flip is not instantaneous, but would take many hundred if not a few thousand years," Floberghagen told Live Science. "They have happened many times in the past. Their estimates of the reversal periods are based on models with slow geological changes, such as the mid Atlantic striping, but that model is only an assumption, as is their belief in slow pole flipping, but seeing as we have not been around long enough to have studied the effect, it may well be that the more recent, faster changes are evidence of a non-linear progression, maybe even exponential. I stopped believing in the standard pole flipping concept when I learned that it required the insertion of imaginary numbers into the equations governing the behavior of a Faraday disk dynamo, the alleged model for the electric and magnetic fields of the earth. But if extraterrestrial causes [eg. the interplanetary or galactic electric circuit] underlie our magnetic field, then not only does a periodic pole switch begin to look more feasible, but also the time frame for reversals is no longer eon-dependent. Personally I favor a different explanation for striping along the mid ocean rifts, ie. the natural magnetic realignment of molten strata being laid down one atop another via the mechanism of seafloor spreading over a short time frame, say months versus hundred-thousands of years. I think accceptance of the magnitude of the events that have occured in the past is the key here, and we struugle to accept, or simply balk at, the possibility of the scales involved. The mid-atlantic trench could have been due to a pole-to-pole discharge, occuring in hours, not days or eons. This image, from a post by solrey, lends weight, IMO, to such an event. It is known that even now there is an electrical current that runs up the mid atlantic trench, and it flows in the deep cold brine, a good conductor because of its high ion concentration. With a greater N-S potential difference, it is possible, if you accept the larger scale models, for it to become the path of an arc mode discharge, which means it becomes a large antenna, with the associated fields, and it could have been those fields which prduced the striping. Rather than a slow, steady spreading of the ocean floor, or even a rapid spreading, I'm leaning towards the removal of material all the way out to the existing coasts of the continents on either side of the trench, meaning that plate tectonics and continental drifting, and the Pangea model, obsolete. Yes, it's a big stretch of the imagination, but I like that kind of exercise. And here is a case where I think their models are wrong, and support the idea of ocean bed plasma shaping and/or excavation. "Whenever icebergs run aground, they leave scours on the seabed. Depending on their depth and location, those markings may continue to exist over long periods of time," explained Jan Erik Arndt, AWI bathymetrician and lead author for this paper. The mechanics don't work, by my reasoning. They need very thich glaciers, but if they are in water, then their bouyancy is going to greatly reduce the downwards pressure. Did these glaciers push the grinders along the sea bed to scour the trenches? They would need to be big rocks to do that. There is a smaller scale example of that just up the coast from me, where at very low tide I have seen a section of a scoured channel, supposdly glacial, about 50 feet wide and 30 deep, with a very consistent cross section for about 200 feet, and a smooth, gouge free surface. Very difficult for me to immagine a big boulder or boulders pressing so deep into the igneous bedrock and leaving such a smooth, regular furrow. Plasma flows, I have no problem imagining. webolife wrote: I stopped believing in the standard pole flipping concept when I learned that it required the insertion of imaginary numbers into the equations governing the behavior of a Faraday disk dynamo, the alleged model for the electric and magnetic fields of the earth. Is there any credibility to the supposed correlation between mid-ocean striping and similar polarization elsewhere, such as in lava flows, and in sedimentary rocks?